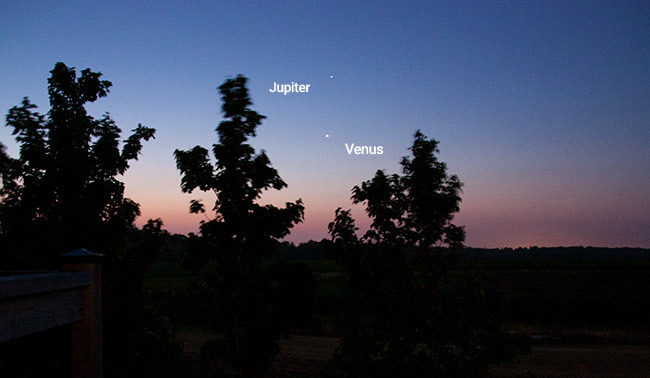 Photographing the five visible planets with your camera is not as difficult as you may think. Planets like Jupiter and Mars are are quite bright, you just need to know where and when to look for them. You can shoot wide-angle shots with a DSLR camera and lens where the planet appears as a bright star, or high magnification views using a dedicated astronomy camera that reveals surface detail. There are a few ways to photograph planets with your camera, but the easiest and most straightforward is using a DSLR, a wide-angle lens and a tripod. You do not need an astronomical telescope to find and photograph the five visible planets (Mercury, Venus, Mars, Jupiter, and Saturn). The planets Venus and Mercury at dawn using a DSLR camera and lens on a tripod. Because the major bodies in the solar system orbit the sun in nearly the same plane of the ecliptic, the position of each planet is predictable and you can plan for photographic opportunities in the future. A suitable telescope that’s mounted to an equatorial mount is capable of high-magnification, detailed views of the larger planets, and even the very distant gas planets such as Uranus and Neptune. This article focuses on capturing the 5 visible planets of our solar system as they are the easiest to find and photograph using basic camera equipment. Unlike deep sky astrophotography, you do not need a telescope or a tracking equatorial mount to capture beautiful images. At a short focal length (300mm or below), you can take a picture of one of the five visible planets in the sky quite easily. The planet may appear as though it is just another star in the sky, but will show characteristics such as color and size that distinguish it from the others. Planets Venus and Jupiter before sunrise. DSLR camera and lens on a tripod. There is no “one-size fits all” solution when it comes to planetary astrophotography. Some cameras are better at capturing a dramatic landscape image at dusk with Venus rising overhead. Others were designed to get a closer look at the polar ice caps of Mars’ surface. Here are a few options to consider when selecting a camera to be used for photographing planets. For wide angle photos photos of planets in the night sky, a DSLR camera is best. 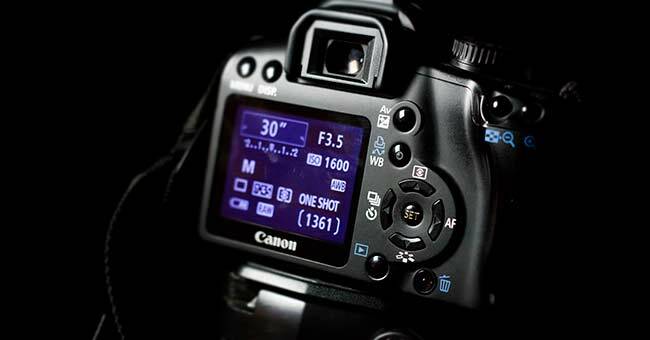 A DSLR allows you to have full manual control of your camera settings from aperture to exposure length. When it comes to astrophotography, leaving the camera shutter open for long periods of time can be advantages. After all, most of the planetary photos you capture will be at night! The longer an image is exposed, the more light that can be collected by the camera sensor. Also, a DSLR gives you the opportunity to photograph planets at different focal lengths using interchangeable lenses. Remember, anything with a focal length longer than about 24mm will begin to show star trailing in an exposure longer than about 15-seconds. 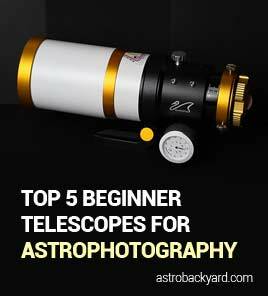 It is also possible to take pictures of the planets at high magnification using a DSLR camera and Barlow lens in your telescope, as described in this informative article by Sky and Telescope. However, a DSLR is probably not the best choice for this type of planetary photography. A dedicated astronomy camera like the ZWO ASI290MM mini is a more practical choice. Mirrorless cameras are also up to the task of planetary photography when used with a camera lens. A point and shoot digital camera (or bridge camera) does not offer the level of control that a DSLR does, but can still capture captivating images of planets in the sky. The planets that often appear close to sunrise or sunset such as Venus are best, as these cameras were not meant for low light photography. One advantage point and shoot digital cameras have over DSLR’s is their small, built in zoom lenses. You may be able to fit the barrel of your camera lens directly into the eyepiece of your telescope! Jupiter, Saturn, and Mars captured using a point-and-shoot digital camera through a Dobsonian reflector. If this is the case, it is best to capture a video file of the planet when using higher magnifications. Depending on the magnification of the eyepiece or Barlow lens you are using, it may be difficult to keep your video of the planet steady. A non-tracking (or GoTo) telescope mount that requires manual movement will make this extra tricky, but it’s not impossible. The good news is, the individual images you extract from the video can be realigned and sharpened in post-processing. These cameras are also capable of capturing detailed images of the Moon using the eyepiece projection method. With the right eyepiece magnification and steady seeing, you can photograph interesting craters of the Moon’s surface. When it comes to an up-close look at the surface of planets in our solar system, a dedicated astronomy camera (or planetary camera) with a small, sensitive sensor is best. These cameras typically have a fast frame rate that (up to 50 frames per second or more), to give you the best shot at capturing moments of clear atmospheric seeing. 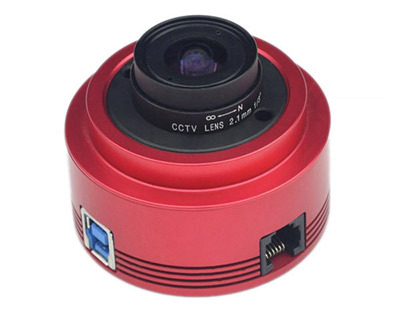 A planetary camera connects directly to your computer with a USB cable, and must be controlled using dedicated software. They do not include a screen on the camera body to review your images or control camera settings. The ZWO ASI224MC is a popular choice to consider for planetary astrophotography. Yes you can photograph planets using your iPhone. For this to work, you’ll want to use the eyepiece projection method with a telescope. Simply place the camera lens of your phone perpendicular to the center of the telescope eyepiece to capture the action. You’ll want to use the manual controls of your iPhone camera to adjust settings such as exposure time, ISO, and aperture (if available). Once you find the right settings to properly expose the planet you are photographing (so the planet is not too bright), the hardest part can be holding the phone steady. Smartphone astrophotography has exploded over the past few years, with impressive images of the planets and the moon being captured every day across the globe. To help keep the camera steady, its beneficial to use a smartphone adapter that holds your phone securely to the telescope eyepiece. 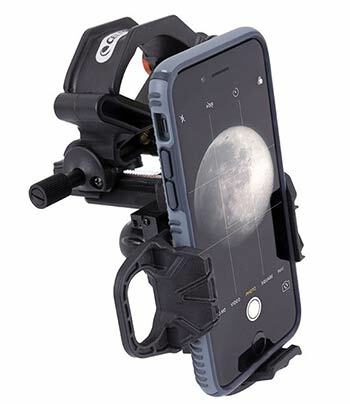 A Celestron smartphone telescope adapter for planetary astrophotography. If you have an astronomy telescope, up-close pictures of the larger planets are possible using amateur equipment. The technique is called eyepiece projection astrophotography, as you will be pointing your camera lens into a telescope eyepiece or Barlow lens that magnifies the image. For example, the photo of Saturn below was captured using a point-and-shoot digital camera. A video of the planet at high magnification in the eyepiece was recorded, and the resulting footage was stacked into a single image. 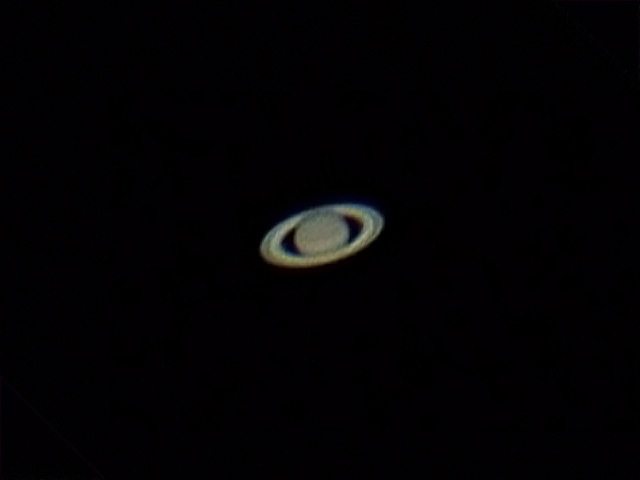 The planet Saturn through a telescope. This method involves selecting the best image frames from your video footage to isolate the moments of the least amount of atmospheric disturbance. Then, you can stack the best image frames (sometimes referred to as “lucky imaging“) together in a software tool like Registax or Autostakkert to really sharpen and enhance your image. Usually, amateur astrophotographers will use a point and shoot digital camera, webcam, or dedicated astronomy camera that is suitable for high resolution planetary imaging. I don’t have a lot of experience in this type of astrophotography, but for a brief rundown of the process, you should check out the following video interview featuring Damian Peach. The first thing you need to do is find out where the Planets will be in the night sky from your location, at a certain time. To find this information, you can use a planetarium software that recreates a current view of the night sky from your location on Earth. I like to use Stellarium, because it’s easy to understand, and free. Simply enter in the coordinates for your location on Earth to generate a “live” look at the current position of the stars and planets in your night sky. To make it easier to locate the planets that are visible to you, you can adjust the label parameters to show only planets, and not the names of constellations, stars, and deep sky objects. Which planets can you photograph without a telescope? As I stated earlier, there are five “visible” planets. These are the brightest planets in the night sky, and ones that anybody can identify and photograph with a little guidance. 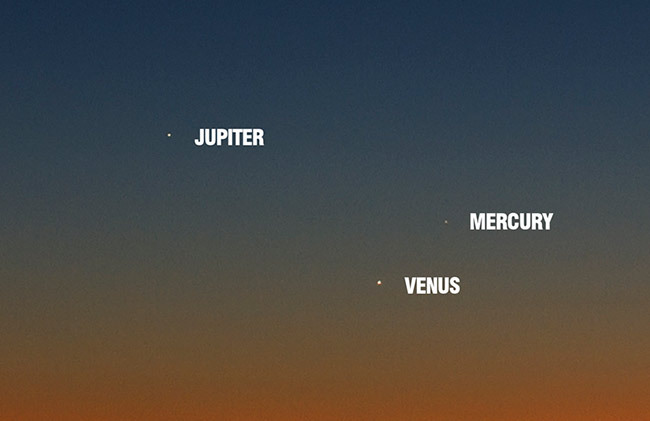 There are 8 planets in total (including Earth), but only 5 are visible to the naked eye. There are inner solar system planets, and outer solar system planets. The planets we can photograph with a DSLR camera are a mixture of both, but only the largest 2 outer solar system planets are within reach of basic camera equipment. The outer solar system planets Neptune and Uranus are too distant and small to find without the aid on an astronomical telescope. A long exposure image may show a tiny “dot” that you have identified to be Neptune or Uranus, but this is not likely the type of planetary photography that interests you early on. The five visible planets are not difficult to photograph with your DSLR camera as long as you use the right camera settings. The timing and location of the planets will play a large role in your camera setting selection process, as some planets appear when the sun is still lighting up the sky. 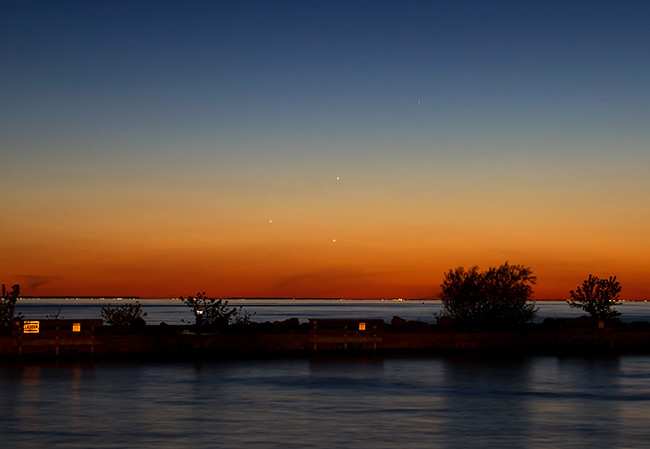 A triple conjunction of planets on May 26, 2013. Jupiter, Venus, and Mercury. First off, you need to know where and when to look for planets if you wish to photograph them. A helpful resource I like to use is the Astronomy Calendar of Celestial Events. All you need to do is look for the “planetary event” icon to find out which planets are well placed for a photo opportunity. For example, you’ll know when Jupiter is at opposition. This means that it is at its closest approach to Earth, and its face will be fully illuminated by the Sun. It will be brighter than any other time of year, and visible all night long. You can also find out when planets like Mercury are at their greatest eastern or western elongation, or when the next transit of Mercury or Venus will occur. The following tips should provide you with some insight on capturing each of the 5 brightest planets using a DSLR or point and shoot digital camera. Over the years, I have photographed the planets in a variety of different scenarios from planet conjunctions to solar transits. Photographing Mercury is tough. This is because Mercury is always close to the sun, making it hard to separate from the bright glow of the sun setting or rising next to it. Mercury can be seen through a pair of binoculars, but can be very difficult to spot due to its proximity to the sun. (It never strays too far). At certain times of the year (during its greatest western elongation) you may be able to spot Mercury with the naked eye if you know exactly where and when to look for it. However, in the daytime (terrestrial) photography world, this is often the best time to take a landscape photograph. The “Golden Hour” is the hour surrounding the time of sunrise and sunset, and offers the most dramatic and beautiful lighting of any time of day. So, use this to your advantage by including some dramatically lit foreground interest in your photo of Mercury. You’ll need a low view of the eastern or western horizon to pull it off, because Mercury will be very low in the sky. For a landscape image of the planet Venus, you’ll likely need to use a shorter exposure image, as the Sun may have just set, or is about to rise. Venus is one of the most obvious planets to identify, as it can be intensely bright. Venus often resembles a star, and has even been nicknamed “The Evening Star”. Venus shows up seemingly out of nowhere, at dusk. This is because the orbit of Venus is on the inside track from Earth, so it always appears to follow the Sun around closely. 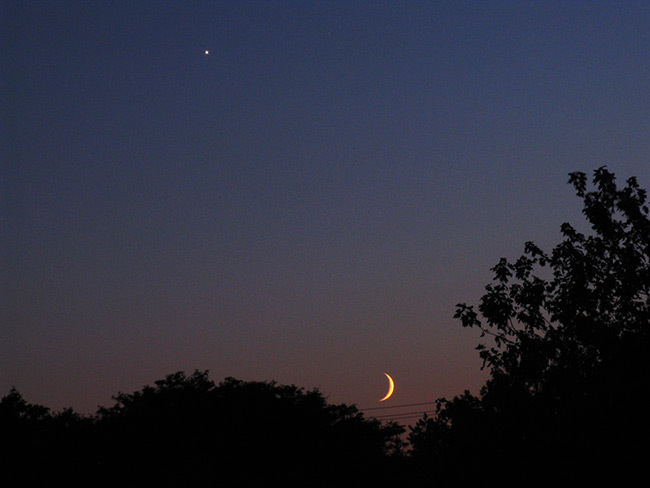 Venus and the crescent moon. Photographed with a point and shoot digital camera. Venus looks like the brightest star in the sky, noticeably so. Check with your planetarium software to confirm the location of Venus to be sure you’ve found it. 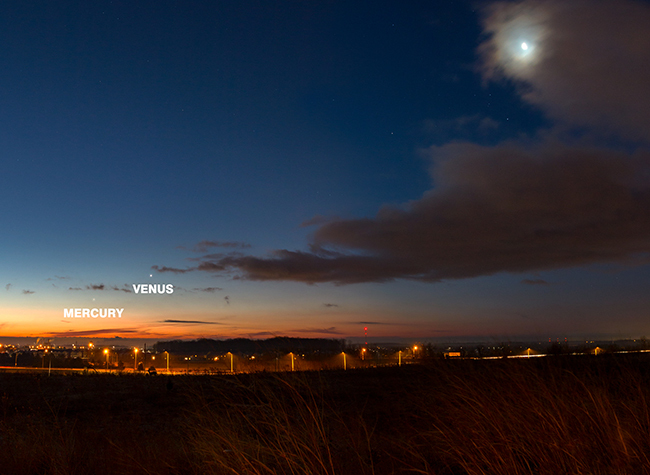 The fortunate timing of the appearance of Venus makes for some unforgettable photographs. One of the most unforgettable ways to photograph the planet Venus, is when it transits (goes in front of) the Sun. In the image below from 2012, you’ll get a excellent depiction of the size Venus appears from our vantage point as it passes in front of the Sun. 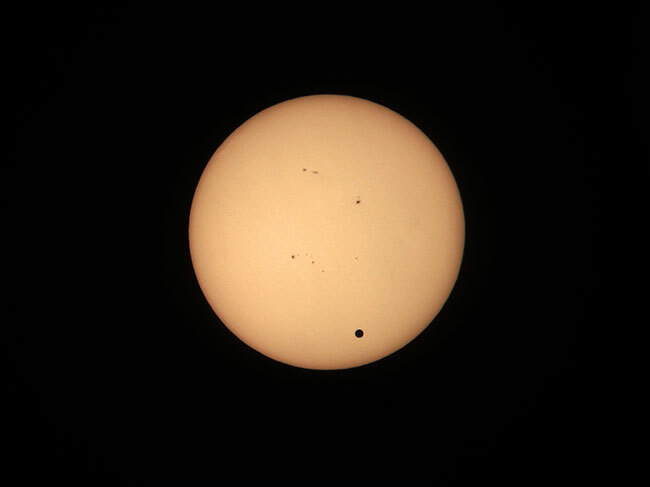 I photographed the transit of Venus on June 5, 2012 from my backyard. Have you ever noticed that band of pink light that sits on the horizon at dusk? 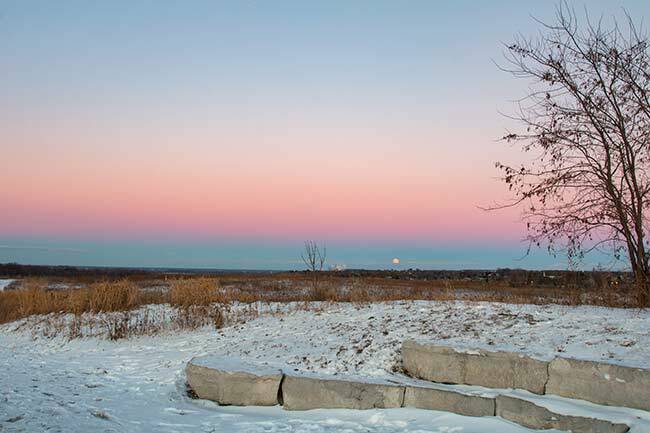 This is called “The Belt of Venus” because it marks the height that Venus often appears from the Sun. The official description of this phenomenon is “an arch of pinkish light above the shadow that Earth casts on the atmosphere opposite the sun”. In the photograph below, you’ll likely recognize that you have seen the Belt of Venus yourself many times. The “Belt of Venus” (pinkish glow on the horizon) at twilight. Unlike Venus, this gas giant can appear anywhere along the ecliptic at any time of day or night. This is because Jupiter’s orbit is long and distant. It is an outer solar system planet that’s orbit stretches way beyond Earth’s. Jupiter is a massive planet, and with the right focal length of lens, can showcase interesting surface details. A camera lens with at least 400mm is needed for this, which will also require steady tracking to follow. A photo of the planet Jupiter through a small telescope. 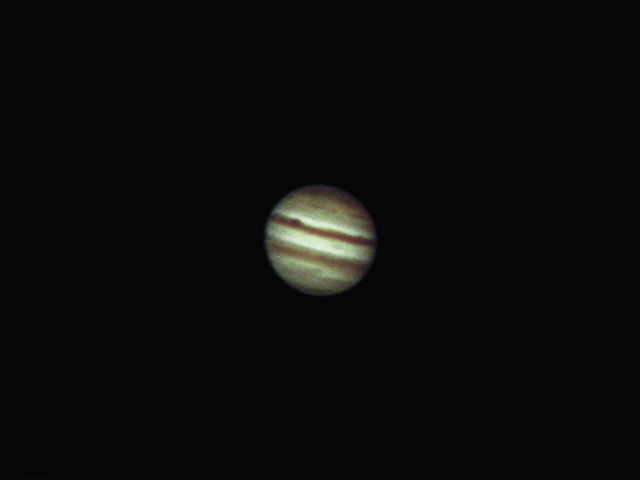 With adequate magnification, Jupiter shows off cloud bands on its surface, along with the Great Red Spot. The rotation of the planet is also observable and can be photographed over the course of one night. You also may notice the 4 largest moons that orbit Jupiter, and their changing positions each night. With an ordinary DSLR camera and wide angle lens (Such as a 18-55mm lens), you can photograph Jupiter in its current placement along the ecliptic (As long as it is not behind the Earth!). A longer exposure image of at least 30-seconds will reveal how much bright Jupiter is than the stars surrounding it. Jupiter makes for a fantastic visual target through a Dobsonian telescope. An aperture of at least 8 inches is recommended for an unforgettable view. The size of the “disc” of Mars can change dramatically over time. The reason Mars can look so much bigger from Earth at certain times than others is because of its elliptical orbit. Mars is an interesting planet to photograph, because of its proximity to Earth, and it’s fascinating surface details. Mars is a terrestrial planet, and the fourth planet from the Sun. Using amateur astronomy and photography equipment, it is possible to record surface details on Mars such as Valles Marineris and its polar ice caps. The planet Mars can reach an apparent magnitude of -2.94, which is surpassed only by Venus, Jupiter, the Moon, and the Sun. Mars is the next planet out from Earth in the orbit of the Planets around the Sun. It’s relatively close to us when compared to other planets. So close, in fact, that we have sent robots from Earth to explore its surface! 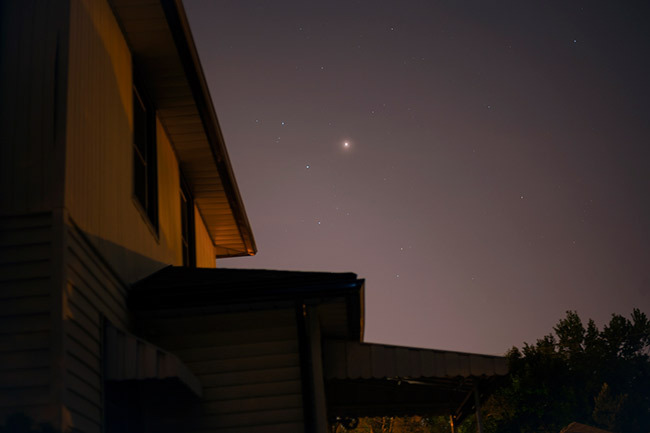 The planet Mars shines brightly from my light polluted backyard in the city. Mars is distinctly red, which becomes obvious when photographing it. 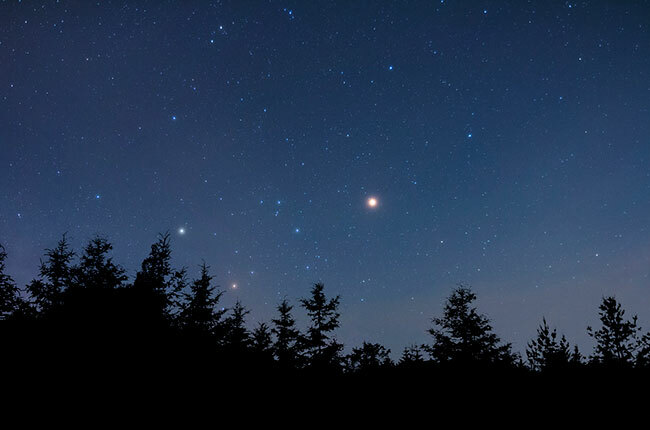 With the naked eye, it may appear to look like an orange “star”, but it’s actually the red planet (Mars). Like Jupiter, the orbit of Mars allows it to freely travel along the ecliptic from Earth and appear at any time of night or day. As you’ll see in the video below, I chose to photograph Mars as it passed the Pleiades star cluster in the constellation Taurus. There are few sights that are more memorable than that of Saturn. This planet is definitely a crowd favorite. Unfortunately, a wide angle camera lens will not show much more than a pale yellow star with a noticeable glow. In the photo below, you’ll see what looks to be an ultra-bright “star” in the constellation Scorpius. The problem is, there is not supposed to be a star here! That’s because the bright yellow orb in this picture is actually the planet Saturn glowing brightly in the summer night sky. The planet Saturn shines brightly in the constellation Scorpius. To see and photograph the rings of Saturn, much more focal length and magnification is needed However, the pale yellow color of Saturn contrasts the red of Mars, which sets it apart in photographs and makes it easier to identify. It is possible to capture a quick photograph of Saturn through the eyepiece of a telescope with enough aperture. This is called eyepiece projection astrophotography, and involves holding your digital camera or smartphone up to the eyepiece objective. As you may have noticed, capturing high magnification, detailed views of the planets in our solar system is not my specialty. I tend to spend more time capturing the planets with my DSLR camera and lens on a tripod than through a telescope. If you have your heart set on capturing detailed, high-magnification photographs of the planets, have a look at some of the equipment involved in this video. To produce detailed portraits of planets like Jupiter, Saturn, and Mars, you need sophisticated planetary astrophotography equipment. Some of my favorite planetary astrophotographers are Damien Peach, and Christopher Go. Have a look at their amazing work for some inspiration and tips.